← An evening with the Super Tuscans on St Paddy’s Day! Rick Bakas has just completed his two-week tour of four states in Australia, sharing his knowledge about wine and social media, with the title “Not in new media in 2011? Then not in business by 2016”. He is touted as the first director of social media in the wine industry and as such has a great deal of experience and expertise to share. Rick has a background in marketing and brand promotion. He worked previously for NIKE Inc. where he managed brands such as the NFL’s Denver Broncos, New York Giants and the University of Oregon. He is now a certified sommelier and author, and specialises in strategic branding advice, particularly in food and wine industries, through Bakas Media. Rick has an impressive record of helping companies such as St Supéry winery in Napa Valley, California, to ramp up their online and promotional activity to boost their image and expand their sales. He introduces concepts to wineries and wine businesses to help them communicate directly with consumers, for example through global online tastings, ‘tweet-ups’ and virtual tours. A range of innovative and thought-provoking examples are given below. His successful social media activity is illustrated by his Twitter following of over 50,000 and Facebook of around 5,000. On behalf of Wine2030, I was lucky enough to attend Rick’s event in Adelaide on 5 April at the National Wine Centre, and he also held similar events in Sydney, Perth and Melbourne, all organised by the wine industry body Wine Communicators of Australia. 1 We are all brand curators/stewards of legacy – everything we post online will live on long after us. For example, an advertisement in a magazine, which you may or may not notice as you flick through, and may not be relevant to you at that moment, will end up thrown away after a few days and gone forever. Its useful life is short and it is not available at the moment when it would be most useful to the customer. Online, brand messages live on, they are portable, and they are available in many forms and at the instant when the customer wants it. The marketer can tell their own story as and when they wish, through all forms of online media, and moreover, they can see the metrics of their customer base – an invaluable tool for any business. 2 Relationships are key – a company should be wary of the balance of building relationships and pushing product promotion. It is easy to turn consumers off and lose their attention. With the inflow we all have these days of emails, updates from Facebook and LinkedIn, tweets, voicemail, and so on, the key question is how to get a customer’s attention. Rick likened the use and evolution of your involvement in social media to growing grapes – the vines must be planted and nurtured, and only after several initial stages can the grapes be harvested to make wine. The same is true of social media. Patience is the key and you must not expect results instantly. Relationships must be nurtured like the vines. Ultimately, this attention online can be converted into sales or an actual behaviour as in the merlot example below. Getting the message through is the key to success in marketing your product. To get the message through, you need to get the customers’ attention – and Rick is the expert in the avenues to do this, as shown in the examples below. The more you care about the community, the more they will care about you and give you meaningful attention. Once you have attention and this is translated into sales or actual behaviour, when people support your brand they will become your brand ambassadors. This is what Rick terms return on attention – a new twist on the traditional business concept of return on investment. 3 Your blog should be the centrepiece of your social media strategy because it is the launch pad for content, be it articles, video clips, photos, discussions, and so on. Other media points to your blog and your blog is linked to your website. Blogs tend to generate more traffic than the website as the content is generally bite-sized, interactive and current. Rick states that it is not necessary to be involved in all forms of social media but you do need to be aware that your brand may appear on them. Soon after arriving at St Supéry winery in the Napa Valley, one tweet linking to a 30 second video on YouTube with footage of Rick promoting their merlot, resulted in sales of nearly 300 cases of this wine in 24 hours. The price was slashed from $25 to $12.50 and the YouTube video had a ‘Buy Now’ button – the deal was available for just 24 hours. Rick stressed that this only worked because the winery had been building the social media strategy for at least three months and had gained following by their wine community. Morton’s restaurant and St Supéry winery helped to boost each other’s image and sales in a joint promotion, as they put short videos on YouTube, and promoted through their websites, Facebook, Twitter, and so on. That month, St Supéry became their number one selling wine through Morton’s. Through his range of social media involvement and leading a company-wide social media strategy, Rick oversaw strong growth in sales at St Supéry. For example, case sales in the first quarter of 2010 jumped by over 90% and the next quarter by over 110%, largely influenced by the social media strategy, in conjunction with some price-cutting of some wines. Furthermore, the level of attrition of wine club members over this time was half the average for the industry. So social media was instrumental in growing sales and also in retaining wine club members (retaining ‘attention’ and loyalty). Rick provided examples of events where he has used the site Eventbrite as a tool to organise events, advertise and register members online for free. Furthermore, the site provides him with the metrics and contact details of these attendees – clearly a useful resource for any company to retain details of interested parties. He has organised events and had people pay online and filled 200 places at an upcoming event in California, while he is in Australia touring, having cost him nothing to do this, and all of the information is online, and the tickets are sold out. Foursquare uses GPS to locate the user and has a number of applications. 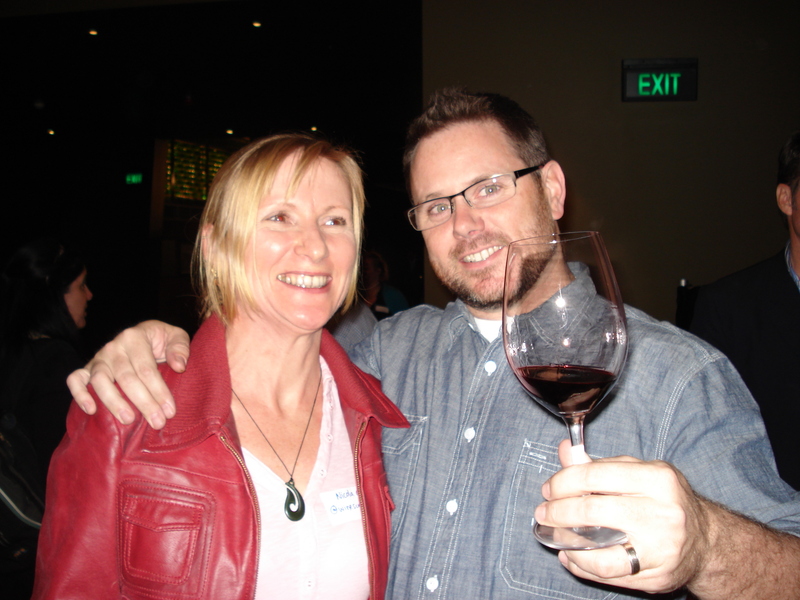 Rick’s example for the wine industry was to offer for anyone to turn up to the winery and cheek in on Foursquare to get a complementary tasting for two – it is not uncommon to have pay for tastings in the US. The winery can also can track where the customers originate with the brand and collate metrics. In addition, it is possible to leave ‘tips’ at locations through Foursquare. He says you can go to all of the accounts that carry your wine (only necessary to visit online, you do not physically have to go there), leave a tip, and when someone checks in they will see this tip. For example, at a restaurant, there may be a tip saying – try our Pauletts Polish River riesling with the lemon sole for a perfect wine and food match. Rick showed us a photo he had taken in an airport of a poster from a bank in the US, of which you could take a picture with your smartphone, and send it to a location online to get a free book downloaded. So people can get a free book for the flight. This is another great way to get people’s attention. The future will move just as quickly! Rick predicts that by 2014 virtually all cell phones will be smartphones, with GPS and the internet. People will increasingly make buying decisions based on this – on a plane, in a shop or restaurant, or at a winery. The mindset is changing around buying decisions with information immediate and freely available. Marketing has to move with this. For example, in future, we will be able to take a photo of a wine bottle, use photo recognition, and access information about it, and even buy it, immediately and through secure means. There may also be the option to ‘like us’ on Facebook, ‘follow us’ on Twitter, and whatever else is available by then. Of course everyone is trying to build their brand online. There are ways to get ahead and get attention. Rick has so many tips – visit Bakas Media, or his blog or follow him on Twitter, and most of all, get involved and media savvy. And start today! Even now with the tricky Australian 2011 vintage you can get a step ahead – why not take a 30 second video of the winemaking, picking the grapes, telling people about the wine and vintage in advance – when the wine comes out the information is already there. This entry was posted in Social media, South Australian wine, Wine news and tagged Australian wine, Rick Bakas, smcadl, sminoz, socadl, Social media, South Australian wine, Wine, Wine Communicators of Australia, Wine2030. Bookmark the permalink. Nice summary. Rick definitely knows his stuff!